In a peaceful location in the pretty town of Salve, along the shoreline between Gallipoli and Santa Maria di Leuca, this recently constructed hotel offers comfortable accommodation at great-value rates. Just 3 kilometres from Pescoluse and close to Salento’s most beautiful beaches, the hotel is a great base for exploring all that the province of Lecce has to offer. The historic centre of Salve is just a short walk away and with the hotel as a base, you can tour the region, exploring all that this beautiful part of Italy has to offer, from art, history and culture, to great wine and delicious cuisine. In winter, thanks to the comfort of the rooms, it becomes an ideal place for a stay of comfort; In autumn, starting point to the streets of culture, art, good food and good wine; In Spring you could walk in beautiful valley "Fani" with an air pure and unspoiled nature; in Summer, to only a few kilometres, you can swim in the beautiful and crystalline sea. 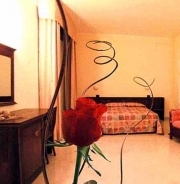 All of the hotel’s comfortable en suite rooms are well-equipped, with all the modern comforts and facilities you need to enjoy a restful like: The rooms feature these services: Phone, Colour TV, Lock electronic security , refrigerator bar, hair Dryer, internet connection WIFI, bath with shower and air conditioning. Almost all of the rooms have a balcony. The quiet, tranquil location guarantees absolute privacy and total relaxation. Above all things, the Arca Hotel is synonymous of service and courtesy; The care and attention give to customers, reflect the personality of the family who takes care of handling, always guardian of the value of hospitality. From the Highway A14 - Bari [Bari North Exit]; go to Brindisi-Lecce direction [exit Tangenziale Ovest]; go to Gallipoli-S.Maria di Leuca direction [1st exit Salve] and follow the signs to the Arca Hotel. Arrived in Lecce, take the train to Ruggiano or Presicce. Not included, by a request, you can ask us a shuttle service. Arrived in Bari or Brindisi take the car or the train to go to Salve (LE). On request you can ask us a shuttle service.